Personalised pet collars made from premium quality waterproof nylon webbing - include your phone number for added protection. 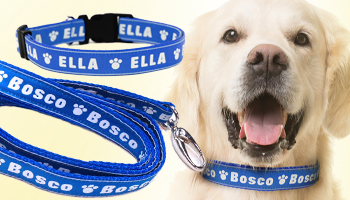 Personalised dog leads available in a range of bright collars. Matching sets available! Personalised dog collars and leads made from premium quality waterproof nylon webbing - include your phone number for added protection. Personalised cat collars made from premium quality waterproof nylon webbing with safety elastic - perfect for those adventurous kitties who like to explore. 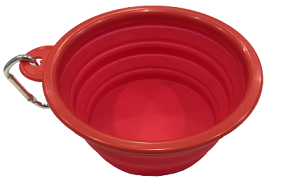 Keep your pets hydrated with our collapsible pet drinking bowl. This handy travel bowl includes a metal ring for easy attachment to your pets lead. The collapsible component means you can easily transfer in your pocket or handbag. 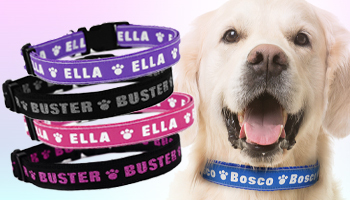 Superior Woven Personalised Pet Collars, perfect your dog or cat! Each of our personalised pet collars and leads area specifically designed for pooches and cats that can sniff out good taste and value for money. Our aim is to provide your furry friends with a unique identity to match their spirited personalities. 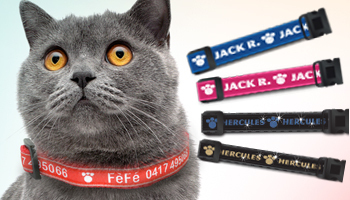 Our super cool customised dog and cat collars can include both your pet's name and phone number for convenient identification. Because it should be safety first when it comes to our best friends! 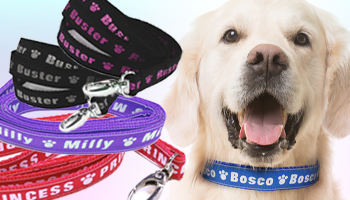 Get your custom pet collar online for your cat or dog today and enjoy fast delivery Australia-wide!